Choose a new telephone number it can be local or toll free. Think from your customer’s standpoint. A phone number that is easy to remember will be the key to getting more customer calls. Imagine using 800 plus your Company Name. Sure, your toll free number will encourage your customers to call you often without paying long distance charges.The next step would be to configure your business greeting, hold-on music or message, and call forwarding number. Instead of hiring a receptionist to answer and handle your calls, you will have a significant cost saving with a virtual phone system that will efficiently interact with your callers. The auto attendant will route calls to a specific employee or department.Callers can be directed to the mobile or land-line number of the subscriber’s choice or can leave a message which is sent to the subscriber via email. Prospective customers often want information about products and services before they get ready to buy. Record salient details about your products /services in a convincing manner so that callers can hear either when the calls are placed on hold or when customers access a specific extension on your toll free number Persuade your callers to leave their contact information or simply use your virtual phone system’s non-blocked caller ID to capture the caller’s phone number.With the call forwarding feature as part of the virtual phone system, business owners and their employees can forward their incoming calls to their mobile phones in order to take calls while they are out of office. This will ensure no important customer call is missed.The final step would be to publish the number and benefit from total call management. To achieve better results, it is suggested that you organize a large-scale promotional campaign for the phone number through social networks, websites, business card, print media, television, radio etc. 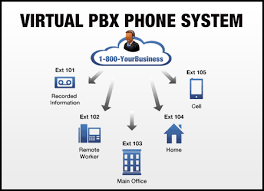 A virtual office phone system also provides businesses with a feature known as an info hotline or sizzle line. The business owner can take advantage and attach a per-recorded message that explains the products, pricing and other relevant particulars.The Virtual phone system will thereafter begin to consistently fetch you direct sales – which you would have missed hitherto. Apart from serving as a powerful marketing tool to boost direct sales, Virtual phone system provides many additional features like caller ID, online faxing, and professional voice talents to record your greetings.